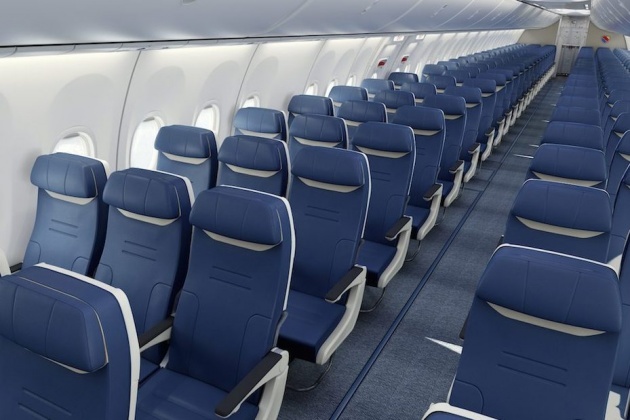 Southwest is one of many airlines introducing slimline seats. They allow carriers to pack more passengers in the same space but many travelers find them uncomfortable. Of course, most travelers also want cheap tickets. Airlines are trying to find the right inflection point. Over the years, seat researchers at B/E Aerospace, which Rockwell acquired in April for $8 billion, have gleaned a few insights about life in the air. Most people are just fine for two hours. As the third hour approaches, stiffness increases and comfort declines. At four hours, however, a sort of derièrre detente is achieved, and the levels of discomfort recede. After all, when you’re stuck inside a sealed, speeding tube at 35,000 feet, resistance is truly futile. While 34 to 35 inches of pitch was once common for economy class, the new normal is 30 to 31 inches, with several major carriers deploying 28 inches on short and medium flights. Meanwhile, the front of the plane where the big money sits remains largely unchanged when it comes to space. The shrinkage, unsurprisingly, has been in back.